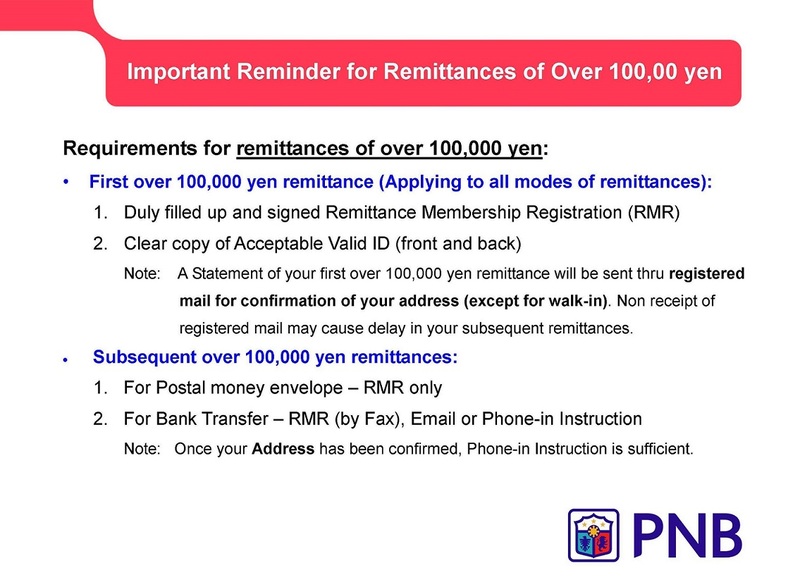 PNB Tokyo is happy to assist you in your remittance needs worldwide! Effective February 15, 2011, the following service is terminated and shifted to Western Union Payment Service UK Limited (Japan Branch) ("Western Union") due to the arrangement of Global Tie-Up between Philippine National Bank, Manila and the Western Union Company, New York, a leader in global payment services. Overseas remittances requested by Walk-in clients to their beneficiaries with no bank account, so called Cash-to-Cash remittances. Philippine National Bank Tokyo Branch together with its Nagoya Sub-branch has executed an outsourcing agreement with Western Union and continues to provide the above mentioned service as an agent and on behalf for/of Western Union, which has been registered with Financial Services Agency of Japan as Money Transfer Service Provider. For details such as restrictions and special notes, please ask the teller at the window set for Western Union or toll- free telephone number at 0120-178-886. Customer Service Center of Western Union also accepts inquiries at 0034-800-400-733. Please note that the service at the window for Western Union is not provided by Philippine National Bank. New legal framework for financial alternative dispute resolution (financial ADR system) provides a fast and simple out-of-court means for resolving problems relating to financial products and services (effective from October 1, 2010). Customers whose disputes with a bank seem insurmountable should use the “Mediation Committee”. For more information, contact the JBA Customer Relations Center. Hours of opening: 9 a.m. to 5 p.m. The JBA is a designated dispute resolution under the Banking Law and Norinchukin Bank Law. In compliance with the newly implemented Bangko Sentral ng Pilipinas Circular no.649, maximum allowable remittance credit for GFC is up to an aggregate amount of 100,000 pesos in a calendar month. Monthly aggregation means that the client can send a maximum of PHP 100,000 in a period of one calendar month. For remittances beyond the monthly allowable credit, money can be sent through Advise and Pay Service (APAS) upon confirmation with the Remitter. Thus, in the example above, the November 25 remittance amount equivalent to PHP 15,000 shall be sent by APAS since as of November 20, 2009, total credits for the November is already at PHP 90,000; remaining remittance credit is only PHP 10,000. On December 1, available remittance credit limit for the month is again at PHP 100,000. To avoid delays in GFC remittances, we recommend that cardholders/beneficiaries keep track of remittance credits. PNB Japan has to confirm with clients GFC transactions that would cause the monthly remittance credits to go beyond PHP 100,000. Non-confirmation will cause the remittance transaction to be put on hold. For future remittances, PNB recommends and offers assistance in the opening of Philippine-based Accounts through APAS. PNB encourages the use of Alien Registration Card (ACR) as ID. In compliance with Japanese regulations, PNB Japan has changed its policy on Acceptable IDs. Most recent Utility Receipts e.g. Gas, Electricity, Water, Telephone, Mobile Phones, etc. Any Japanese Government issued document reflecting current address in Japan. Philippine Passports are acceptable as valid ID for 90-day-visa holders for over-the-counter transactions. Effective April 1, 2008, PNB Tokyo has aligned in accordance to the Japan Bankers Association “Compensation for fraudulent withdrawal”, which was announced on 19 February. 2008. PNB Tokyo will reimburse customers who have been victimized by fraudulent loss through withdrawal from their Savings Deposit Account by use of stolen passbook, in line with the Depositor Protection Law and the guideline stated in the Terms & Conditions for Deposit Account. In the case of customer's “gross negligence” or “negligence”, PNB Tokyo will discuss with the customer and handle the cases individually. Depositors' immediate notification of the incident is mandatory for receiving compensation. Please inform us immediately by phone or e-mail when your passbook is stolen or lost.